A natural compound in mulberries could be a new treatment for losing weight by stimulating brown fat and boosting metabolism. Rutin, a compound in mulberries, could potentially help the treatment of obesity. 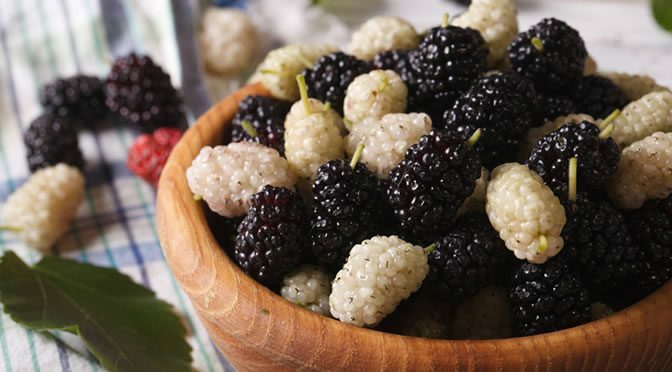 Mulberries are also high in antioxidants and flavonoids offering a number of health benefits such as anti-inflammation, anti-cancer activity, lower blood sugar and cholesterol levels. In the U.S. 1 in 6 young people and 1 in 3 adults are obese, making this condition a major health issue. The health impact is even bigger: examples include high blood pressure, type 2 diabetes, some types of cancers, heart disease and stroke. There are ways to treat obesity, including a healthy diet and improving physical activities, but changes in lifestyle can sometimes take longer, therefore alternative methods can be helpful for some individuals. In this case, researchers examined the metabolic effects of rutin — a compound found in mulberries. Exposure to the cold causes brown fat to activate, which makes the body produce heat through burning energy. Rutin acts like a “cold mimetic” by increasing the activity of UCP1, a protein coding gene found in brown fat. Rutin also generates brown-like (beige) fat cell formation in the innermost layer of the skin. In this study 1 milligram per millilitre of rutin was added to mice’s drinking water. Mice were divided into two groups; one had diet-induced obesity and the other group was genetically obese. They found rutin did activate brown fat in both groups, which led to enhanced energy expenditure, balanced blood glucose and reduction in fat. “The beneficial effects of rutin on BAT-mediated metabolic improvement have evoked a substantial interest in the potential treatment for obesity and its related diseases, such as diabetes. Based on these findings, Dr Jin and colleagues believe that rutin supplementation can be a new effective treatment for obesity and problems related to weight gain. The study was published in The FASEB Journal (Yuan et al., 2016).